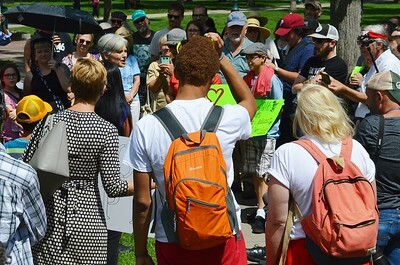 Jill Stein, Green Party candidate for President, marched with supporters through downtown Colorado Springs then spoke at a rally at a local church. 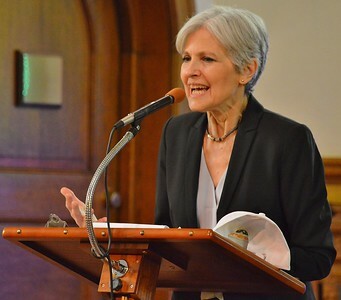 Jill Stein, Green Party candidate for President, speaks to supporters at a rally. 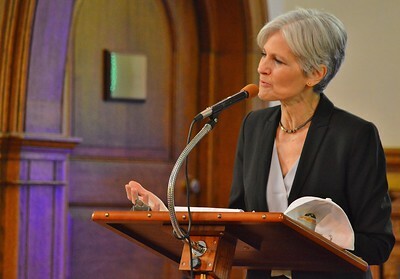 Jill Stein, Green Party candidate for President, speaks to supporters at a rally. Supporters in the background, TV news reporters in foreground extending microphones. 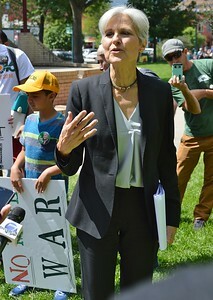 Jill Stein, Green Party candidate for President, speaks to supporters at a rally. 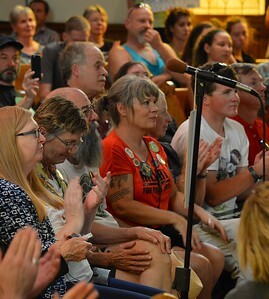 man wearing "Iraq Veterans Against the War" t-shirt in the background. 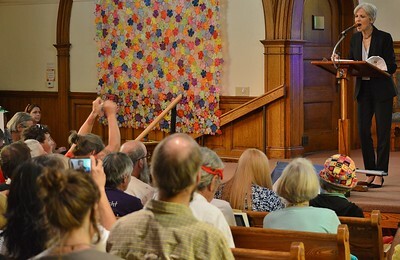 Jill Stein, Green Party candidate for President, surrounded by supporters, speaks at a rally. 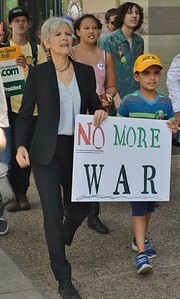 Jill Stein, Green Party candidate for President, carries "No More War" sign with young boy as they march together at campaign event in Colorado. 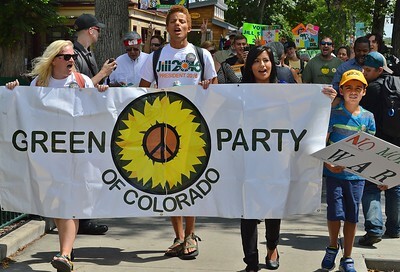 Green Party of Colorado members carry a large banner in campaign march. 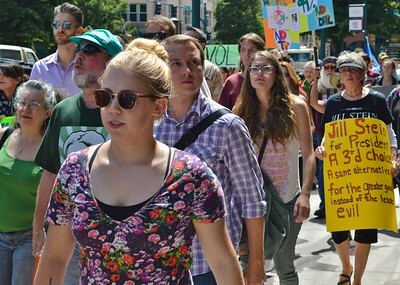 Large group of Jill Stein supporters hoding campaign signs march in Colorado Springs. 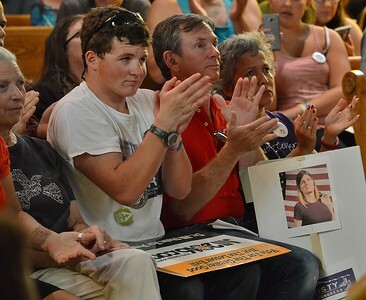 Man holds "Jill2016" sign above his head at campaign rally. 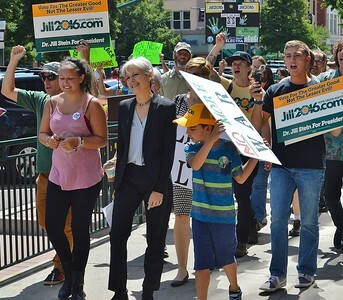 Jill Stein, Green Party candidate for President, marches along side of supporters carrying sign and chanting, at campaign event in Colorado. 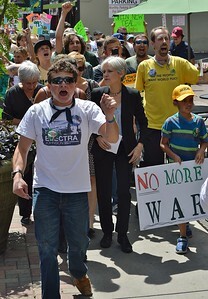 Jill Stein, Green Party candidate for President, marches along side of supporters at campaign event in Colorado. 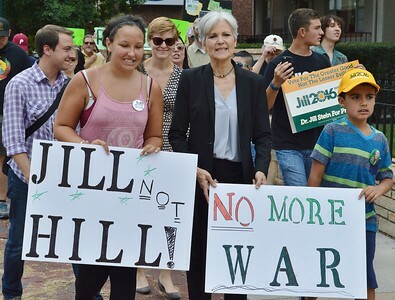 Man in front shouts and raises fist in air, young boy next to Stein carries "No More War" sign. 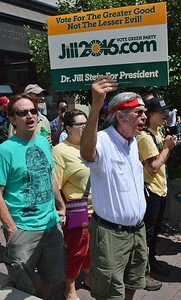 Jill Stein supporters march with signs at campaign event in Colorado Springs. 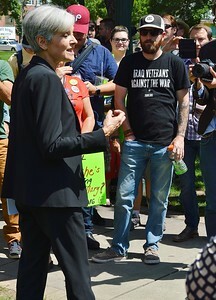 Jill Stein, Green Party candidate for President, listens to supporter while marching in campaign event in Colorado. 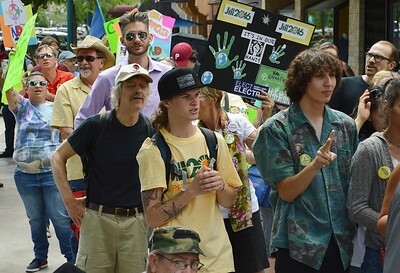 Supporters of Green Pary Presidential candidate, march with signs at Colorado campaign event. 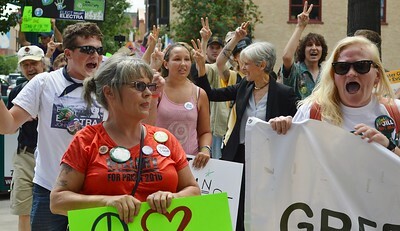 Jill Stein, Green Party candidate for President, marches along side of supporters at campaign event in Colorado. Stein and other raise hands in peace sign. 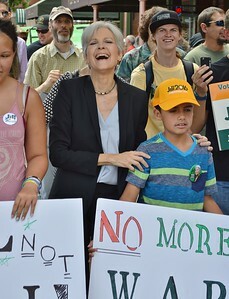 Jill Stein, Green Party candidate for President, with hands on shoulders of young boy next to her, marches along side of supporters at campaign event in Colorado. 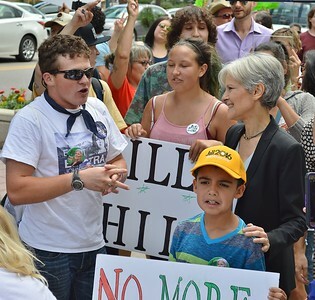 Jill Stein, Green Party candidate for President, marches along side of supporters at campaign event in Colorado, including young woman carrying "Jill Not Hill" sign and young boy with "No More War" sign. 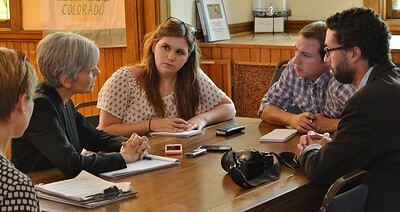 Jill Stein, Green Party candidate for President, talks with members of the news media. All sitting together at a table. 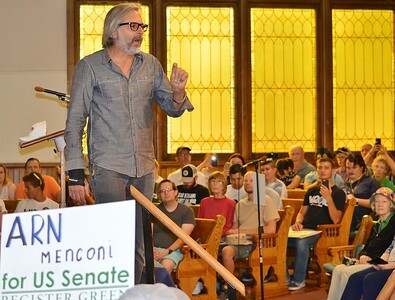 Green Party candidate for US Senate seat in Colorado, Arn Menconi, speaks at a campaign rally in Colorado Springs. 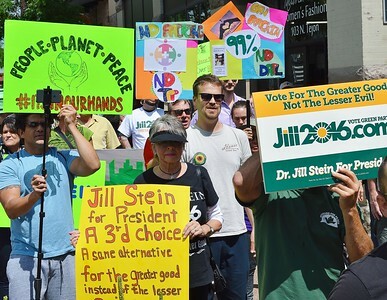 Supporters of Jill Stein, Green Party candidate for President, standing with signs and applauding. 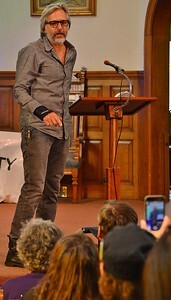 Jill Stein, Green Party candidate for President, gestures while speaking from a podium at a rally in Colorado Springs. 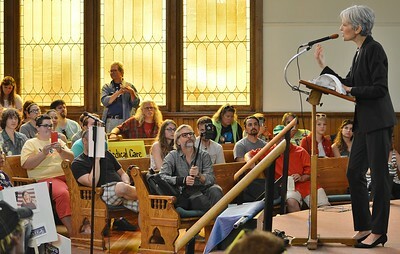 Green Party Presidential candidate Jill Stein, speaks from a podium as supporters look on. 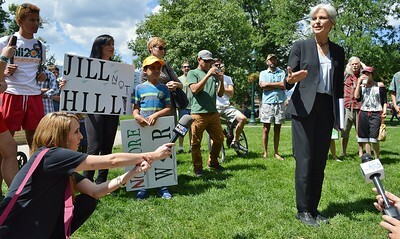 Jill Stein, Green Party candidate for President, speaks at a rally in Colorado Springs. 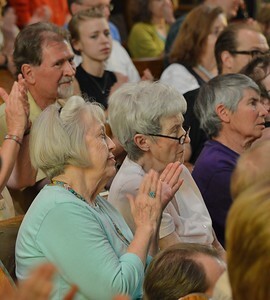 Woman applauds while listening to Jill Stein at campaign rally, other sitting around her. 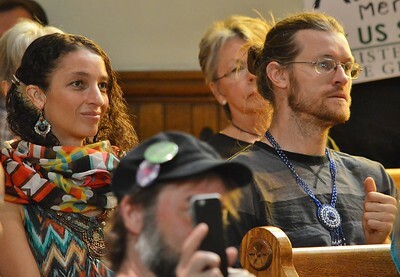 Supporters of Green Party Presidential candidate Jill Stein listen to her speak at a rally, some applauding. 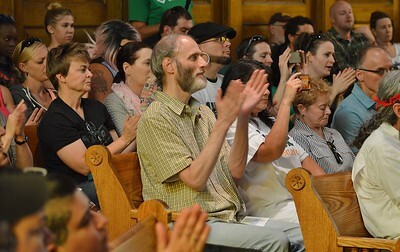 Supporters of Green Party Presidential candidate Jill Stein, applaud while listening to her speak at a rally. 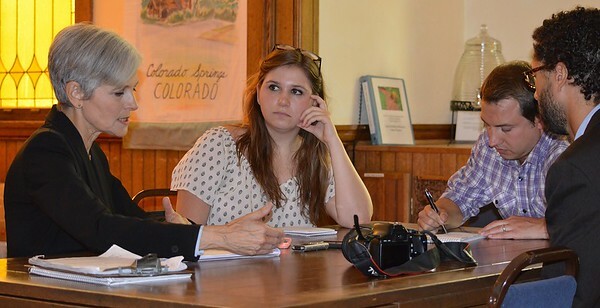 Young woman listens intently at speech by Jill Stein, Green party candidate for President. 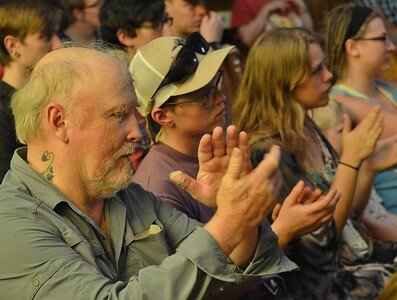 Supporter of Jill Stein, Green Party candidate for President applauds at a campaign speech in Colorado. 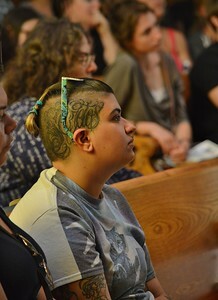 Young woman with tatoo on side of her head, listens intently at speech by Jill Stein, Green party candidate for President. 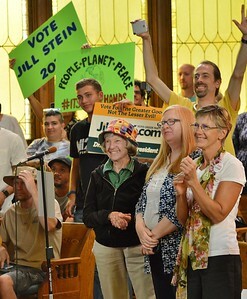 Supporters of Green Party Presidential candidate Jill Stein listen to her speak at a rally. 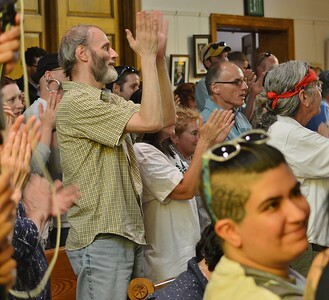 Supporters of Green Party presidential candidate Jill Stein, stand and applaud at campaign speech in Colorado. 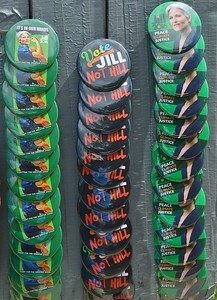 Display of campaign buttons for Jill Stein, Green Party candidate for President.